Constant tests and trials await the senior students. Beyond simulated missions and classes, they'll also have to buckle down to learn about agents, prospective teams, internships, and other seemingly endless elements of being a Hero. For some, however, the classroom is only one aspect of the trouble that lies ahead. 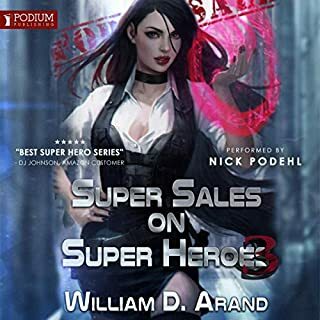 Long-buried secrets have been unearthed; old mysteries are finally unraveling; and what lies at the center of it all has the potential to rock the realm of Heroes to its very foundation. The conclusion was satisfying but I can't help but wonder if there's continuation of a second series? Great ending to a great series. 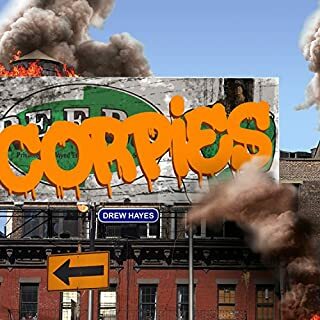 Hopefully Drew Hayes will continue with spinoffs like a Corpies book 2! 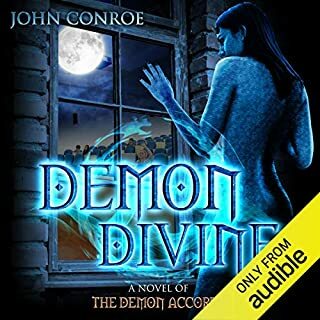 #audible1 great series, a light summer popcorn read with relateable characters and an excellent performance. 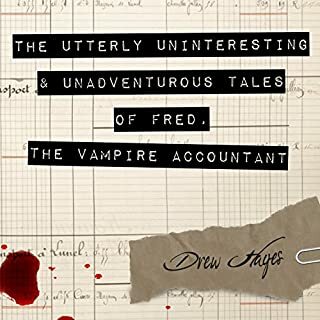 Through the many books by Drew Hayes you can see him evolving each word written. I accompanied some of his development and you can clearly see compared to the first book of the series that not only the characters grew but the writting became more interesting. I greatly look forward to other spin offs in this world. 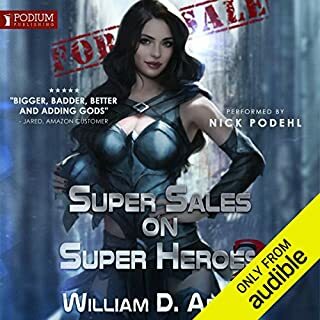 I first discovered Hayes' world of Supers when Audible put Corpies on sale last year. I have since INHALED everything from that world, and am currently on my fifth listen through. 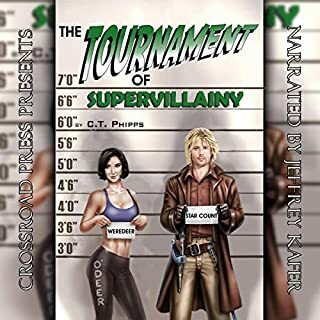 The stories are well-planned, the author has a definite ability to avoid serious continuity errors, it goes from serious to making me laugh hard enough to cry, and the plots are complex without being TOO complex. The narration is well-performed, and I love that they used the same voice for all four books. 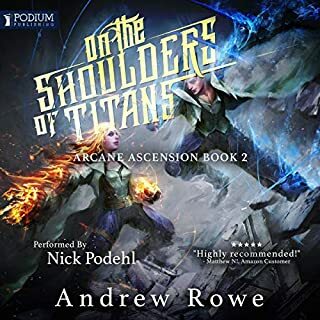 McCarley did a great job of sustaining the various voices throughout all four books (by book four there are one or two that aren't quite the same they were in the earlier ones, but if I hadn't been listening to all four in a row I doubt I would have noticed). What can I say? 150+ hours well spent. I laughed, loved, and cried with the Lander bunch. While this last book is very long its well worth the listen! The character's stories are done really well done and the pieces come together nicely. 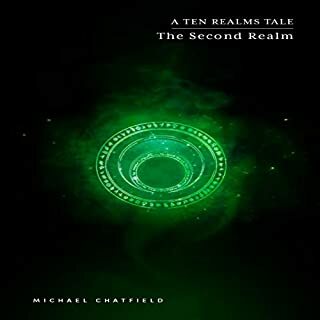 The narrator has done a great job with this series and this book is no different. All the voices come out as different people and its easy to tell who is who. The characters stories are completed nicely and even some of the side characters get good air time. I really like the bits with Will. This was a good culmination of a great story line. Satisfying resolutions along with a hint of maybe more to come. Before I go on what might end up being a massive tangent, this series is possibly my all time favorite I have ever read/listened to and I am quite literally unable to express in words how highly I want to praise this book. Buy it, read it and enjoy the ride. I have always loved Drew Hayes works. It has gotten to the point where if I see a book from him I don't even look at the book summery, I just get it because I simply know it is going to be good. Its how I picked up the first installment of this series. 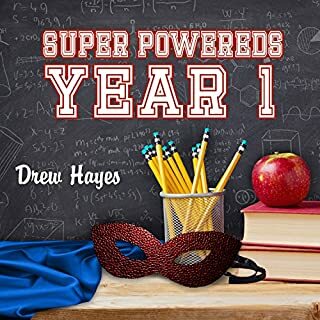 Two years ago I saw a preorder for a book labeled "Super Powereds Year 1" I got it and the next day when it was available for download I went to work as usual and started listening as I worked at the daily grind. The book was 26 hours long and I think I finished that book in three days. Meeting Vince, Roy, Hershel, Mary, and Nick, learning about their powers and fears. Seeing them overcome that first year had me hooked more than I could have ever expected. And Drew could not have picked a better narrator than Kyle McCarley, with his range of voices breathing life into each character. When the second book came along I vividly remember getting angry because I hadn't known it was out yet and started listening to it a few days after the fact. But as soon as I had seen it, another credit was quickly shelled out and the story developed more. The class was smaller, but here and there some familiar faces were around outside of the main circle that I could remember. I was growing to know the class of lander and each power was getting interesting applications. Hell, Drew managed to make the day to day drama between student interesting even when bombshells weren't dropping. In no time at all the 32 hour book had sped along and ended on me leaving me waiting for the next installment. Just shy of a year and I had the next book. Now things were getting intense. The training was ramping up and plots deepening. It was about halfway through that book that I realized that I had gotten to the point I was remembering each students powers and names. I suppose that might be a simple thing but to just see someone mention one of the other minor characters, and not even need a moment to think about who their talking about with a cast this expansive is an impressive feat in my opinion at least. Every character was becoming familiar, adding to the story in different ways. With each book getting longer you would think it might last longer, but every time the books felt like they were getting devoured faster. Corpies came out next, and even with me normally hating side stories, I was drawn into the adventures with Titan and couldn't stop from loving the book. It was so good I would have followed any of the characters if Drew went all out and did a spinoff book of a spinoff book. One more year passed before this book came out. A new job has me unable to listen to books nearly as long as I used to. Even so, bit by bit I chipped away at this 60 hour monster of a finale. Plots came together and schemes were resolved. With a cast this large I can only even think of one plot thread that wasn't completely and entirely wrapped up and resolved one way or another. That is not to be taken as a detraction either, if anything I mean it as a massive complement to Drew. Almost nothing felt forgotten. When this book came to a close and the epilogue mentions a 10 year jump I felt genuine sadness. Not for the way things ended, which was simply amazing, but because with an ending like this I doubt we will be seeing another installment in this series. This world that Drew has made and these characters will always have a cherished place in my heart. All of that and the most wonderful thing about it? 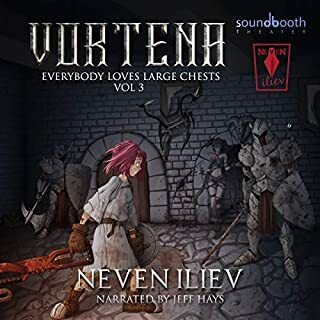 Not counting the time I have spent re listening to this series, or playing a bit of the first one to hook in a friend to try the books out, this series is easily 180 hours. That is over 7 and a half days of my life I have spent with these books. Now that its over, I look back on them all and smile remembering the highs and lows. Great memories of the truly epic battles and the mundane moments that charmed me. And I find myself reaching over for my phone to download the first book once more. 60 hours of Super Powered goodness still ain't enough! 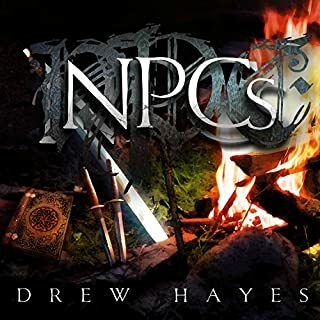 I don't know if you can call this a non-bias review considering, I devoured the hardback edition months ago, I pre-ordered the audio version, downloaded it the moment it became available on its release date, and then promptly put in a marathon listening session to complete the book... To say that I'm a Drew Hayes fanboy would be an understatement. With that said, I did fully enjoy the book. Unlike so many series conclusions, not only was "Year 4" a satisfying conclusion to this series, it was nothing less than epic! The unraveling of the conspiracy was truly a captivating work of inspired and well conceived story telling. As much as I enjoyed the book, it feels a bit odd to say that even at a run time of 60 hours, I still felt that it was a bit rushed (I felt that some of the interpersonal relationship development between some of the characters was sacrificed to keep the story a bit more streamlined). I did really enjoy a few little side plots that were thrown in (diving deeper into the "company" that Mr Transport and Mr Numbers work for was a great touch, and the reveal of yet another secret family connection was a shocker). 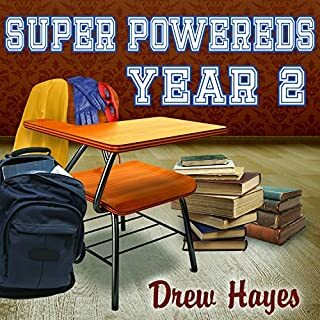 As with the pervious books, Drew Hayes masterfully crafts witty commentary and logical character actions into a story plot that has clearly been planed since he first put pin to paper way back in "Super Powers: Year 1". 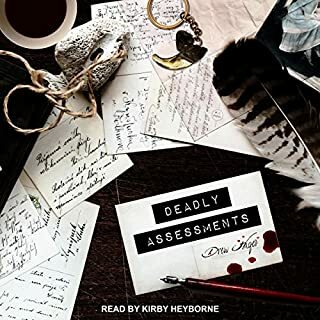 I also feel compelled to give a tip of the hat to Kyle McCarley's superb narration. Given the huge number of characters contained within this story, I was continuously amazed by his ability to add a nuanced and unique voice performance to each of the many characters. Simply put... even a casual fan of the "Super Powered" series will be well satisfied with its conclusion, and more than likely will find themselves as much of a raving fanboy as I am. Welcome to the club! Once again, Drew Hayes has produced an amazing story that is engaging, character-driven, and never predictable. Coming off of such a tragic ending of Year 3, this book follows the story of our favorite 5 seniors, as well as the rest of the group we have learned to love. 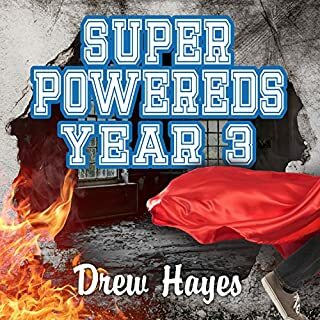 Drew seamlessly weaves loose ends together to create powerful story lines which have been only hinted about since year 1. Kyle McCarley narrates this monster of a book with the care we've come to expect with this series. I still find it amazing that he is able to do so many voices with such consistency. At 60+ hours, this is a book well worth a credit. The entire series now measures 160 hours and is a series you can listen to multiple times and get new things with each listen. With these four books, we have an amazing college experience that is realistic with the addition of some super powers to spice it up. There is such an intricate and elaborate universe that is so much fun to learn more about. And then, there's the steady rise to the climax that made me want to reach the end quicker than my ears could handle. This is an amazing work that you will enjoy from day one to the epilogue party. Absolutely incredible book and series!! Great story, loved every minute of it. Thank you Drew! 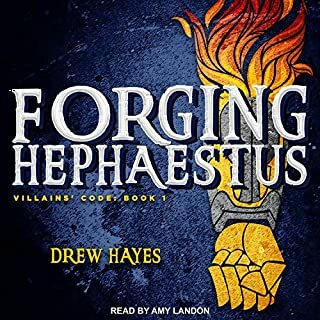 I couldnt wait for this one to be released (and I'm waiting for the 2nd installment of Drew Hayes' villain world with eager anticipation too). Reading through the reviews, already knowing they would be fantastic, I was still sceptical about all the "Perfect Ending" remarks. Seriously, it's been years since that many people have all unequivocally agreed on something in this country, so I took it with a grain of salt. They reviews are dead to rights - this was the perfect closing for this series. I've never felt this happy and satisfied with a favored series ending until now. Another book in this series would be too much. Immortalizing the characters at the point in there lives within the epilogue was perfect. I don't want to think of these brilliant characters in any other way than Mr. Hayes has penned in this book. A truly fun and touching read and listen. Thank you Mr. Hayes! A superb conclusion to the series! Action packed with plot twists, sometimes a little bit predictable, but very well written and narrated. Loved it and I regret finishing it since its the last book of the series. 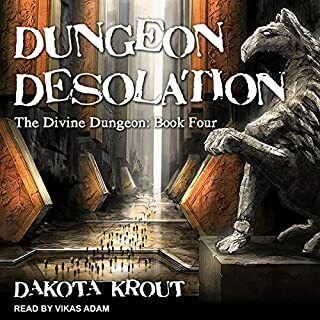 I have listened through all the previous years and Corpies several times, so with a good understanding I can say that this series is so far the top of the list of the books I have been listening to on Audible. Hayes has given us the final year we dreamed of. An epic 60 hour non stop thrill ride packed with suprises, shocking revelations, and incredible action. I laughed, I cried, I was occasionally stunned. McCarley does an amazing job of bringing this enormous cast of characters to life (and it IS enormous). overall 10/10 would recommend. Best one in the series, one hell of a satisfying conclusion! 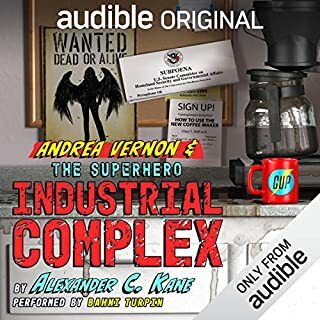 More than 60 hours of one of the best stories available on audible. 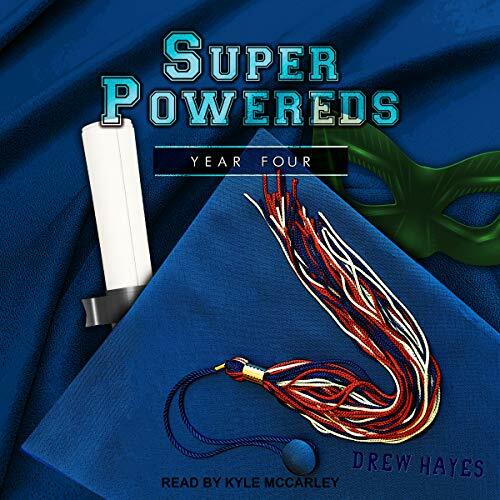 I have absolutely loved the Super Powered’s universe and have listened to years 1 - 3 and Corpies several times and boy am I glad I did, because year 4 was the best of the series and offered an amazing and satisfying conclusion. 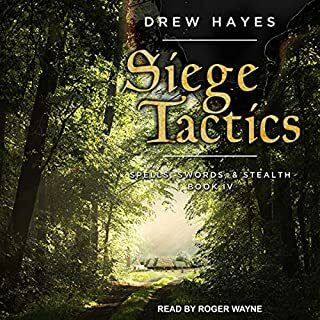 Drew Hayes has become my favorite author recently and Kyle McCarley is nothing short of a narrating genius. I am only sad because this wonderful journey is over; but what a journey it was🤓. I love the narrator and his take on the characters. His efforts on acting the scenes out is appriciated. Also if you have not read CORPIES then you should. It is a story that revolves around the hero Titan. It is definently good enough to get and a lot of the characters from the book are in the fourth so read it between the third and fourth. This is unfortunently the end to the story wth your main chatacters and has a great ending. However there is a huge opening and hint for the story to continue. A forshadowing that implies there will be more. Here is to hoping. I'm sad it's over, but it was incredibly well done. The "10 years later" epilogue was a great touch, giving far more closure than the vast majority of series offer.